(Washington, D.C.)—In a letter to the 48-member states of the Nuclear Suppliers Group (NSG), a group of 18 leading nuclear nonproliferation experts expressed "deep concern and opposition to pending proposals that could grant India and Pakistan membership in the NSG on the basis of an exceptional political preference—rather than on the basis of a common, strong, and meaningful set of nonproliferation and disarmament benchmarks for NSG membership." The Nuclear Suppliers Group is are expected to discuss the Indian and Pakistani bids for membership at its plenary meeting in Seoul during the week of June 20. The experts warn: "It is our assessment that any further country-specific exemptions from NSG guidelines for trade and/or membership without compensating steps to strengthen nonproliferation and disarmament would increase nuclear dangers in South Asia, and weaken the NSG and the broader nuclear nonproliferation regime." Signatories of the letter sent to the NSG participating governments include two former special representatives to the President of the United States on nonproliferation and the former U.S. negotiator for civil nuclear cooperation agreements. "Neither India nor Pakistan meets the NSG’s membership criteria,” the letter continues, "nor does either country meet the same standards of behavior as current NSG members, nor is it clear that either state shares the NSG’s basic nonproliferation motivations, including the NSG’s efforts to stem the spread of sensitive nuclear fuel cycle technologies that could be used for nuclear weapons purposes." Under the guidelines of the NSG, membership requires that a state is a member of the nuclear Nonproliferation Treaty, among other considerations. In 2008, the United States pushed through an India-specific exemption from the NSG’s requirement that a state have full-scope international safeguards in order to be eligible for civilian nuclear trade. “Unfortunately,” said Daryl G. Kimball of the Arms Control Association, "the United States has in the past month rejected consideration of proposals from some NSG participating governments for a criteria-based approach to membership. The Obama administration should adjust its irresponsible approach." For the full list of endorsers and the text of the letter, see below. We are writing to express our deep concern and opposition to pending proposals that could grant India and Pakistan membership in the Nuclear Suppliers Group (NSG) on the basis of an exceptional political preference — rather than on the basis of a common, strong, and meaningful set of nonproliferation and disarmament benchmarks for NSG membership. It is our assessment that any further country-specific exemptions from NSG guidelines for trade and/or membership without compensating steps to strengthen nonproliferation and disarmament would increase nuclear dangers in South Asia, and weaken the NSG and the broader nuclear nonproliferation regime. Neither India nor Pakistan meets the NSG’s membership criteria, nor does either country meet the same standards of behavior as current NSG members, nor is it clear that either state shares the NSG’s basic nonproliferation motivations, including the NSG’s efforts to stem the spread of sensitive nuclear fuel cycle technologies that could be used for nuclear weapons purposes. Since the NSG granted an India-specific exemption for India from its longstanding full-scope safeguards standard for nuclear trade in September 2008, the Indian government has not met the nonproliferation commitments it pledged it would meet in return for the exemption: its civil-military nuclear separation plan is not credible; its IAEA Additional Protocol arrangement is far weaker than those of the nuclear-armed states; and the administrative arrangements negotiated by the United States and other nuclear suppliers for tracking India’s nuclear material are insufficient. India and Pakistan have refused to accept critical disarmament responsibilities and practices expected of all other nuclear-armed states, including a legally-binding commitment not to conduct nuclear tests (such as signing the 1996 Comprehensive Test Ban Treaty), halting fissile material production for weapons, and reducing nuclear and missile arsenals. Instead they are increasing their nuclear arsenals. Thus, there is no basis to accept the argument offered by U.S. officials that Indian membership in the NSG would give India more of a stake in the nonproliferation regime. Pakistan, which has a history of transferring sensitive nuclear fuel cycle technology and is expanding its own nuclear weaapons capabilities, has an even weaker case for NSG membership than India. In our view, the best way to bolster the global nonproliferation and disarmament effort is to set strong standards for new membership that reaffirm the basic objectives and purposes behind the NSG and strengthen its role as a multilateral institution. *Institution listed for identification purposes only. Today the White House announced that on May 27 President Barack Obama will become the first serving U.S. president to visit Hiroshima and its Peace Memorial Park, which honors the victims of the world’s first atomic bombings seventy years ago. (Washington, D.C.)—Today the White House announced that on May 27 President Barack Obama will become the first serving U.S. president to visit Hiroshima and its Peace Memorial Park, which honors the victims of the world’s first atomic bombings seventy years ago. “We applaud President Obama's decision to visit Hiroshima, in part to recognize the innocent victims of war and, in particular, the experience and work of atomic bomb survivors of Hiroshima and Nagasaki—the hibakusha—who have worked tirelessly to remind the world why nuclear weapons must never be used again,” said Daryl G. Kimball, executive director of the independent, non-partisan Arms Control Association. “Just as importantly, he should use the opportunity to map out concrete actions the United States and other countries can and will pursue to move closer to a world free of nuclear weapons,” said Kimball, who visited Hiroshima and Nagasaki in August of last year. “With just months remaining, Obama can still make a positive impact but only if he is more creative and is prepared to provide bolder leadership,” Kimball wrote in an editorial earlier this month, which describes key steps the president could announce. “Obama’s visit to Japan represents one of his last and best opportunities to take steps necessary to head off a new phase of global arms competition and establish a more meaningful legacy on nuclear disarmament,” according to Kimball. Ten days after President Obama’s visit to Japan, on June 6, the Arms Control Association’s Annual Meeting will feature as keynote speakers Deputy National Security Advisor Ben Rhodes and one of the most prominent and active Hiroshima survivors, Setsuko Thurlow. Details are online here. (Washington, D.C.) – An effective new tool for improving global nuclear security is in danger of being lost, according to a new report by the Arms Control Association (ACA) and Partnership for Global Security (PGS). The report concludes that regular, voluntary commitment-making by states has resulted in many of the Nuclear Security Summits’ most important accomplishments, but it is not clear if world leaders will choose to preserve this tool after the six-year summit process ends on April 1. The new report from ACA-PGS features 53 country profiles that demonstrate how the summits’ political momentum and commitment-making model has resulted in meaningful actions by all of the participating countries. Every state has made at least one national commitment to strengthen nuclear security and some countries have been prolific in their pledges, particularly Canada, Japan, Kazakhstan, Netherlands, Norway, Philippines, Republic of Korea, Spain, United Kingdom, and United States. Additionally, more than 90 percent of the participating countries issued voluntary, national progress reports detailing how they were implementing their responsibilities and breaking an important taboo against information sharing. Among the summits’ chief accomplishments are the recovery or elimination of more than 1,500 kilograms of highly-enriched uranium and separated plutonium, the establishment of dozens of new training and support centers, and updates to national laws on nuclear safety and security by most states. The report also proposes that the commitment-making model of diplomacy developed at the summit has itself become a central summit outcome, pointing to its adapted use at the most recent climate conference in Paris. 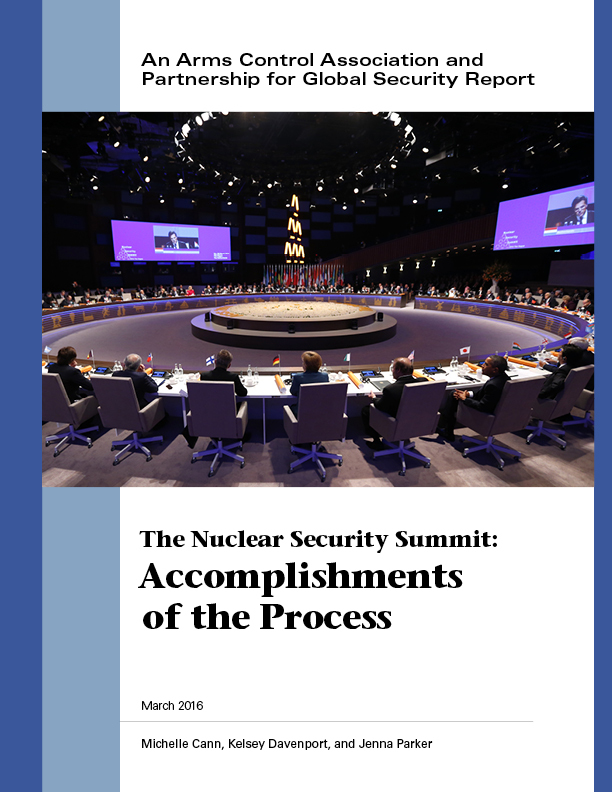 The full report, The Nuclear Security Summit: Accomplishments of the Process, is available online. The Partnership for Global Security mounts a global effort to strengthen global nuclear security governance and promotes practical policies to ensure all nuclear material and facilities are secure. (Washington, D.C.)—Today, EU High Representative Federica Mogherini and Iranian Foreign Minister Mohammad Javad Zarif said that Iran and six world powers (China, France, Germany, Russia, the United Kingdom and the United States) completed requirements for implementing the historic July 14 nuclear deal, which blocks Iran’s pathways to nuclear weapons and strengthens the global nonproliferation regime. Taken together, the restrictions dramatically roll back Iran’s uranium-enrichment capacity, block its route to nuclear weapons using plutonium, and put in place a multi-layered monitoring regime that keeps every element of Iran’s nuclear fuel cycle under surveillance. Additionally, Iran is prohibited from conducting activities or experiments relevant to a nuclear explosive device, even for conventional purposes. Without this deal, the time it would have taken Iran to develop nuclear warheads would have shrunk dramatically, putting Tehran just weeks away from producing enough fissile material for a bomb if it chose that path. This hard-won nonproliferation victory demonstrates the international community’s commitment to preventing the spread of nuclear weapons and significantly diminishes the future prospect of an Iranian nuclear arsenal. In the months and years ahead, the United States and its negotiating partners must continue to diligently implement every element of this critical agreement and fully support the International Atomic Energy Agency in its work to verify compliance with the deal.—KELSEY DAVENPORT, director for nonproliferation policy, and DARYL G. KIMBALL, executive director. The Arms Control Association is an independent, membership-based organization dedicated to providing authoritative information and practical policy solutions to address the dangers posed by the world's most dangerous weapons. (Washington, D.C.)—Iran is expected to complete the steps necessary to trigger implementation of the July 2015 nuclear deal, known as the Joint Comprehensive Plan of Action. Once the International Atomic Energy Agency has verified that Iran has taken these steps, which were agreed to in the nuclear deal concluded between the P5+1 (China, France, Germany, Russia, the United Kingdom, and the United States) and Iran, nuclear-related sanctions against Iran will be lifted. Arms Control Association resources and experts are available to explain implementation day and its significance for international peace and security. “The Comprehensive Nuclear Agreement with Iran at a Glance,” Arms Control Association, Fact Sheet, October 2015. “UN Security Council Resolutions on Iran,” Arms Control Association, Fact Sheet, August 2015. “Iran Dismantling Centrifuges, IAEA Reports,” by Kelsey Davenport, Arms Control Now, November 19, 2015. “Timeline of Nuclear Diplomacy with Iran,” Arms Control Association, Fact Sheet, January 2016. Vote for the 2015 Arms Control Person(s) of the Year! The Arms Control Association is dedicated to providing authoritative information and promoting practical solutions to address the dangers posed by the world's most dangerous weapons: nuclear, biological, and chemical, as well as certain types of conventional arms. Every year since 2007, the Arms Control Association's staff has nominated several individuals and institutions that have advanced effective arms control, nonproliferation, and disarmament solutions and/or raised awareness of the threats posed by mass casualty weapons. Each of this year’s nominees has, in their own way, provided leadership to help reduce weapons-related security threats. We invite you to cast your vote (one per person) for the 2015 Arms Control Person(s) of the Year. 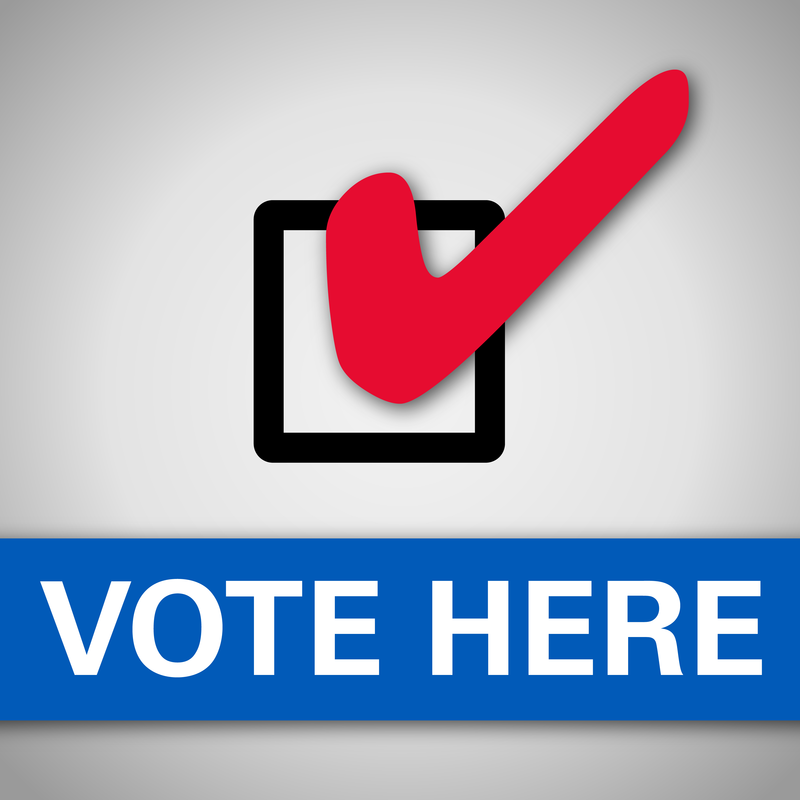 Click here to vote and enter "ACPOY2015" as the password. Online voting will be closed at 11:59 p.m. on January 5, 2016 and the results announced January 7, 2016. Alberto Augusto, director of Mozambique’s National Demining Institute for coordinating the clearance of landmines from the territory of Mozambique—which was completed in 2015—and in recognition of the work of thousands of mine clearance workers, mine clearance NGOs such as the Halo Trust, and donors for more than two decades of work. The government of Mozambique estimates that as many as 10,900 persons throughout the country had been killed or injured by landmines that were deployed during the country’s multi-decade civil war. Mozambique is still contaminated by other types of unexploded ordnance and continues to struggle to raise funds for assistance for landmine victims and disability-inclusive development activities. For more information, see: http://bit.ly/1PQGfad and http://bit.ly/1NBC0wS. The National and Transnational Serious Crimes Investigation Unit (NTSCIU) of Tanzania for the capture and arrest of Yang Feng Lan, who is alleged to have helped smuggle around $3 million worth of ivory since 2001 and is also suspected of financing the purchase of weapons and vehicles for poaching gangs; for the arrest of Boniface Matthew Mariango, one of the most prolific elephant poachers and ivory traffickers in East Africa, and who has managed over 15 poaching syndicates that have been operating throughout Tanzania, Burundi, Zambia, Mozambique and southern Kenya with impunity for years. For more information, see: http://bit.ly/1OdX88H. EU High Representative Federica Mogherini, U.S. Secretary of State John Kerry, and Iranian Foreign Minister Javad Zarif and the members of the technical and political negotiating teams of the European Union, the United States, Russia, the UK, France, Germany, China, and the Iran for successfully negotiating the July 2015 Joint Comprehensive Plan of Action (JCPOA). The deal establishes a strong and effective formula for blocking all of the pathways by which Iran could acquire material for nuclear weapons and for promptly detecting and deterring possible efforts by Iran to covertly pursue nuclear weapons in the future, in exchange for the removal of nuclear-related sanctions against Iran. For more information, see: http://nyti.ms/1OdXg81. Setsuko Thurlow and the Hibakusha of Hiroshima and Nagasaki for their unyielding dedication to sharing first hand accounts of the catastrophic and inhumane effects of nuclear weapons, which serves to reinforce the taboo against the further use of nuclear weapons and spur action toward a world without nuclear weapons. For more information, see: http://huff.to/1IA5cEc. Former Moldovan police investigator Constantin Malic, his fellow investigators, and the U.S. Federal Bureau of Investigation (FBI) for their efforts to halt the smuggling of nuclear material. The partnership has prevented the sale of radioactive material which can be used in a so-called "dirty bomb" through sting operations over the course of five years. Most recently, in February 2015, their joint undercover work resulted in the arrest of a smuggler who believed he was selling cesium to Daesh terrorists. For more information, see: http://apne.ws/1jKjhmx. The World Medical Association and the American Medical Association for their 2015 statements warning "that even a limited nuclear war would bring about immense human suffering and substantial death toll together with catastrophic effects on the earth’s ecosystem,” and calling on "all governments to refrain from the development, testing, production, stockpiling, transfer, deployment, threat and use of nuclear weapons and to work in good faith towards the elimination of nuclear weapons." For more information, see: http://bit.ly/1Tw3zI7. Former U.S. Secretary of Defense William J. Perry for raising attention to the risk of renewed nuclear weapons competition and calling for restraint. In a series of public appearances, opeds, and in his book, My Journey at the Nuclear Brink, Perry has warned that “… far from continuing the nuclear disarmament that has been underway for the last two decades, we are starting a new nuclear arms race” with Russia, argued against proposals for new land-based intercontinental ballistic missiles and new nuclear-capable cruise missiles, and called for renewed efforts for the entry into force of the Comprehensive Test Ban Treaty. Click here to vote and enter "ACPOY2015" as the password. Past winners of the "Arms Control Person of the Year" are: Austria's Director for Arms Control, Nonproliferation, and Disarmament Ambassador Alexander Kmentt (2014), Executive-Secretary of the CTBTO Lassina Zerbo (2013); Gen. James Cartwright (2012); reporter and activist Kathi Lynn Austin (2011), Kazakhstan's Deputy Foreign Minister Kairat Umarov and Thomas D'Agostino, U.S. National Nuclear Security Administration Administrator (2010); Senator Richard Lugar (R-Ind.) (2009 ), Norway's Foreign Minister Jonas Gahr Støre and his ministry's Director-General for Security Policy and the High North Steffen Kongstad (2008), and U.S.Congressmen Peter Visclosky (D-Ind.) and David Hobson (R-Ohio) (2007). If you find the the Arms Control Association’s resources and work of value, please consider making a contribution online. Our continued efforts depend on the support of individuals like you. The Arms Control Association (ACA) is an independent, membership-based organization dedicated to providing information and practical policy solutions to address the dangers posed by the world's most dangerous weapons. ACA publishes the monthly journal, Arms Control Today. Read more about Vote for the 2015 Arms Control Person(s) of the Year! Media Contacts: Kelsey Davenport, director of nonproliferation policy, 202-463-8270 ext. 102; Daryl G. Kimball, executive director, 202-463-8270 ext. 107; Timothy Farnsworth, communications director, 202-463-8270 ext. 110. (Washington, D.C.)—The Director-General of the International Atomic Energy Agency (IAEA) released his final assessment today on Iran’s past activities that could be related to nuclear weapons development, the so-called possible military dimensions (PMDs) of Tehran’s nuclear program. Yukiya Amano’s Dec. 2 report assessed that Iran conducted a coordinated “range of activities relevant to the development of a nuclear explosive device” prior to the end of 2003 and some of the activities continued after 2003. According to the assessment the “activities did not advance beyond feasibility and scientific studies, and the acquisition of certain relevant technical competences and capabilities.” The report said that the IAEA had no credible indications of these activities continuing after 2009. The investigation was completed as part of a July 14 agreement between Iran and the IAEA. The agency had laid out its concerns in an annex to a November 2011 report, which covered a range of issues primarily relating to activities pre-dating 2004—from acquisition of materials to explosive testing. “The IAEA’s assessment that Iran was engaged in activities relevant to the development of a nuclear weapon prior to 2004 is not surprising. That finding is consistent with what U.S. intelligence agencies, and nonproliferation watchdogs—including the Arms Control Association—have long-assumed,” said Kelsey Davenport, director for nonproliferation policy at the Arms Control Association. “The agency’s finding that there are ‘no credible indications’ that Tehran continued weaponization activities after 2009, or diverted nuclear material in connection with its past activities, is a strong indication that Iran has abandoned a coordinated nuclear weapons effort,” she added. "While the director-general’s report is a critical step, it does not, however, ‘normalize’ Iran’s nuclear program in the eyes of the International Atomic Energy Agency or the international community. Iran’s nuclear activities will remain under a microscope and subject to a multi-layered monitoring and verification regime. The IAEA also will continue to work to reach a ‘broader conclusion’ on Iran’s nuclear program – meaning that there has been no diversion of declared nuclear materials and no indication of undeclared nuclear materials and activities over a period of time. That will provide greater assurance that Iran’s nuclear program is entirely peaceful,” Davenport said. “Iran’s long-overdue cooperation with the IAEA’s investigation is an important and necessary step forward to ensure that Iran is not pursuing nuclear weapons in the future,” said Daryl G. Kimball, executive director of the Arms Control Association. "It opens the way for the the Board of Governors to recognize the director-general’s report and for Iran to take the steps necessary to implement the nuclear deal between Iran and six world powers—known formally as the Joint Comprehensive Plan of Action (JCPOA),” Kimball said. “Under the terms of the JCPOA, the IAEA will have more wide-ranging authority to monitor Iran’s ongoing nuclear work and verify Iran’s compliance with the JCPOA. The IAEA will have increased access to Iran’s nuclear sites, including every element of its fuel supply chain, and the ability to investigate evidence of any alleged illicit nuclear activities at undeclared sites, including military bases. That will provide greater assurance that Iran is not pursuing a covert nuclear weapons program in the future,” Kimball added. The IAEA Board of Governors will convene for a special meeting on Dec. 15 to discuss the results of the director-general’s report and to determine the appropriate response to the report’s findings. “Contrary to the assertions of some, the agency does not need to know every detail of Iran’s past work to monitor and verify Iran's compliance with the terms of the JCPOA. This is due to the fact that the IAEA’s verification scheme is based on the widely-held assumption that Iran did engage in weapons-related research in the past and that it achieved the capability to produce weapons-grade nuclear material and to weaponize that material some time ago,” said Davenport. “With the JCPOA, the IAEA will have considerable flexibility to investigate evidence and concerns about any possible future weaponization activities. Without the JCPOA, the agency would have far less access and information to detect and deter illicit nuclear activities in the years ahead. Moving forward, it is critical that Iran and the P5+1 continue to take steps to follow-through on their commitments under the nuclear deal,” Kimball noted. (Washington, D.C.)—Today Secretary of Defense Ashton Carter announced the U.S. Air Force’s decision to award the contract for the new, nuclear-armed, long-range penetrating strike bomber (or B3) program, which would cost in excess of $100 billion to design and build 80-100 of the planes. The bomber buy is just one part of the Pentagon’s plan to spend at least $348 billion to maintain and rebuild the nuclear arsenal and refurbish the nuclear weapons complex over the next decade, according to a 2015 Congressional Budget Office (CBO) report. “Given the B52H and B2A bombers are expected to remain in service through 2040 and 2060, respectively, there is no need to rush forward with the new strategic bomber, especially when it will compete with other high priority Air Force and Pentagon nuclear and conventional priorities,” said Kingston Reif, director of disarmament and threat reduction policy with the Arms Control Association. Current plans to rebuild all three legs of the existing nuclear "triad" and their associated warheads, including 12 new ballistic missile submarines, up to 100 new long-range, nuclear-capable bombers, 642 new land-based ballistic missiles, and 1000 new, nuclear-capable long-range standoff cruise missiles. "We believe the administration’s redundant, all-of-the-above approach to rebuilding all of the major U.S. nuclear weapons delivery systems at levels beyond realistic deterrence requirements is unsustainable and will deplete resources from higher national security priorities," said Daryl Kimball, executive director of the Arms Control Association. The Air Force wants a total 1,000 of the new nuclear-armed cruise missiles for use by all three bombers—the B52H, the B2A and the B3—at a development cost of some $20-30 billion. "The Pentagon has failed to provide a compelling reason why it needs both a new penetrating bomber and a standoff missile to meet the nuclear deterrence requirements of the United States and our allies," said Reif of the Arms Control Association. “The requirement that the air-leg of the U.S. triad have two means to assure mass destruction against the most advanced air-defenses constitutes excessive redundancy. Other weapons, such as submarine-launched ballistic missiles, can penetrate air defenses with high confidence,” Reif added. In an Oct. 15 op-ed in The Washington Post, William Perry, President Bill Clinton’s defense secretary, and Andrew Weber, President Barack Obama’s assistant secretary of defense for nuclear, chemical, and biological defense programs, called on President Obama to cancel the nuclear-capable air-launched cruise missiles program. Perry and Weber described nuclear-armed cruise missiles as “a uniquely destabilizing type of nuclear weapon.” Foregoing the development of a new version “would not diminish the formidable U.S. nuclear deterrent in the least" and "could lay the foundation for a global ban on these dangerous weapons” they wrote. “Proponents of the new nuclear air-launched cruise missile say that it provides the president with flexible options in the event of a crisis and the ability to ‘control escalation’ in a conflict with another nuclear-armed state. In other words, the missiles would come in handy for nuclear war-fighting,” Reif said. “The thinking behind the new cruise missile is inconsistent with the stated goal of President Obama to reduce the role and number and salience of nuclear weapons in U.S. military strategy,” Kimball charged. “Future nuclear force planning needs to take into account the fact that the President's 2013 nuclear weapons employment guidance allows for a one-third reduction below New START levels, but even if the United States maintains New START warhead levels, it can do so at significantly lower cost," Kimball said. "Despite warnings from senior officials that the current modernization plans are unaffordable, Secretary Carter and President Barack Obama have failed to make common-sense adjustments. They can and should trim back, and in some cases, forgo redundant and costly systems, such as a new nuclear-armed cruise missile, and save taxpayer dollars," Kimball added. During his trip to the United States, Pope Francis may continue to call for the United States to take further steps toward a world free of nuclear weapons. Media Contacts: Daryl G. Kimball, executive director, 202-463-8270 ext. 107; Kelsey Davenport, director of nonproliferation policy, 202-463-8270 ext. 102; Timothy Farnsworth, communications director, 202-463-8270 ext. 110. At the 59th meeting of the International Atomic Energy Agency Conference last week, the Vatican said that “nuclear deterrence can hardly be the basis for peaceful coexistence among peoples and states in the 21st century.” The statement, issued by Vatican Secretary for Relations with States Archbishop Paul R. Gallagher also called for a "real efforts toward facilitating the entry into force of the CTBT [Comprehensive Test Ban Treaty]" and endorsed the July 14 nuclear deal between Iran and six world powers saying it ensures the peaceful nature of Iran’s nuclear program. During his trip to the United States he will address Congress on Sept. 24 and the UN General Assembly in New York on Sept. 25. Pope Francis may continue to call for the United States to take further steps toward a world free of nuclear weapons. For more information on the Catholic Church’s views on nuclear weapons, see the following resources. “From Nuclear Deterrence to Disarmament: Evolving Catholic Perspectives,” Gerard Powers, Arms Control Today, May 2015. The Pope versus the Bomb (event video), Bishop Oscar Cantu, former Senator Sam Nunn, Professor Maryann Cusimano Love, Sept. 17, 2015. U.S.-Iranian Religious Leaders’ Dialogue: The Relevance of Moral Questions Related to Nucelar Weapons (event transcript), Bishop Richard E. Pates, Ebrahim Mohseni, Dr. Stephan Colecchi, and Daryl G. Kimball, October 29, 2014. Statement of the Holy See to the 59th General Confernece of the International Atomic Energy Agency, Paul R. Gallagher, Sept. 14, 2015. Iran Nuclear Deal "A Net-Plus for International Nuclear Nonproliferation"
Media Contacts: Daryl G. Kimball, executive director, 202-463-8270 ext. 107; Timothy Farnsworth, communications director, 202-463-8270 x110. The group of experts write in their statement that the July 14 agreement “ … advances the security interests of the P5+1 nations (China, France, Germany, Russia, the United Kingdom, and the United States), the European Union, their allies and partners in the Middle East, and the international community." The statement concludes: “… we believe the JCPOA meets key nonproliferation and security objectives and see no realistic prospect for a better nuclear agreement." The agreement, which was negotiated by the P5+1 and Iran and has been approved by the UN Security Council, will be voted on by the U.S. Congress in September. The JCPOA will establish long-term, verifiable restrictions on Iran's sensitive nuclear fuel cycle activities, many of which will last for 10 years, some for 15 years, some for 25 years, with enhanced IAEA monitoring under Iran's additional protocol agreement with the IAEA and modified code 3.1 safeguards provisions lasting indefinitely. “This statement from more than 70 of the world’s leading nonproliferation specialists underscores, as President Barack Obama recently noted, the majority of arms control and non-proliferation experts support the P5+1 and Iran nuclear deal,” said Daryl G. Kimball, executive director of the Arms Control Association, which organized the nonproliferation specialists' statement. The full text of the statement is available below. You can also download a PDF version, here. The Joint Comprehensive Plan of Action (JCPOA) is a strong, long-term, and verifiable agreement that will be a net-plus for international nuclear nonproliferation efforts. It advances the security interests of the P5+1 nations (China, France, Germany, Russia, the United Kingdom, and the United States), the European Union, their allies and partners in the Middle East, and the international community. When implemented, the JCPOA will establish long-term, verifiable restrictions on Iran's enrichment facilities and research and development, including advanced centrifuge research and deployment. Taken in combination with stringent limitations on Iran’s low-enriched uranium stockpile, these restrictions ensure that Iran’s capability to produce enough bomb-grade uranium sufficient for one weapon would be extended to approximately 12 months for a decade or more. Moreover, the JCPOA will effectively eliminate Iran’s ability to produce and separate plutonium for a nuclear weapon for at least 15 years, including by permanently modifying the Arak reactor, Iran’s major potential source for weapons grade plutonium, committing Iran not to reprocess spent fuel, and shipping spent fuel out of the country. The JCPOA is effectively verifiable. The agreement will put in place a multi-layered monitoring regime across Iran’s entire nuclear supply chain, including centrifuge manufacturing sites (for 20 years), uranium mining and milling (for 25 years), and continuous monitoring of a larger number of nuclear and nuclear-related sites. The JCPOA requires Iran to implement and ratify the additional protocol to Iran’s comprehensive safeguards agreement, which significantly enhances the International Atomic Energy Agency’s (IAEA) inspection regime. Among other measures, this will give international inspectors timely access to any Iranian facility of proliferation concern, including military sites, which the JCPOA will ensure cannot be stalled more than 24 days without serious consequences. In addition, the JCPOA puts in place safeguards that require early notification of design changes or new nuclear projects by Iran (the modified code 3.1 provision). The additional protocol and code 3.1 monitoring and verification measures will remain in place indefinitely. The JCPOA also requires that Iran cooperate with the IAEA to conclude its long-running investigation of Iran's past activities with possible military dimensions (PMDs) and permanently prohibits certain dual-use activities, which could contribute to the design and development of a nuclear explosive device. Taken together, these rigorous limits and transparency measures will make it very likely that any future effort by Iran to pursue nuclear weapons, even a clandestine program, would be detected promptly, providing the opportunity to intervene decisively to prevent Iran from acquiring a nuclear weapon. The agreement requires that Iran undertake major steps—including to reduce its uranium enrichment capacity, modify the Arak reactor, allow for more intrusive international monitoring, and cooperate with the IAEA’s PMD investigation—before UN Security Council, U.S., and EU economic and financial sanctions are suspended or terminated, and it provides for swift consequences in the event of noncompliance. If all sides comply with and faithfully implement their multi-year obligations, the agreement will reduce the risk of a destabilizing nuclear competition in a troubled region – giving time and space to address other regional problems without fear of an Iran armed with nuclear weapons—and head off a catastrophic military conflict over Iran's nuclear program. Though all of us could find ways to improve the text, we believe the JCPOA meets key nonproliferation and security objectives and see no realistic prospect for a better nuclear agreement. We urge the leaders of the P5+1 states, the European Union, and Iran to take the steps necessary to ensure timely implementation and rigorous compliance with the JCPOA. **Endorsement received after August 18 release date.